Route 196 is an underground bar with cool lighting, wooden panels and graffiti art works on the walls. Legendary bands like The Dawn and The Jerks have played here. Acoustic performers, band nights and even iPod nights are regular features. A must-try is the Noypi pizza. Light, crunchy but not too salty, it combines tinapa (dried fish) flakes and kesong puti (white cheese). 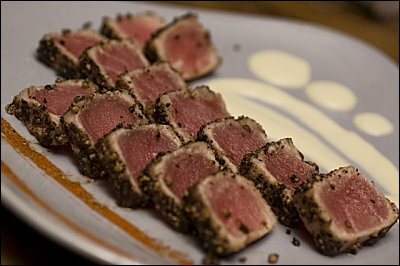 The pepper-seared tuna with wasabi sauce, chili cheese sticks and tinapa rolls are all spicy and delicious. When you’re stuck in a traffic jam, take this route.